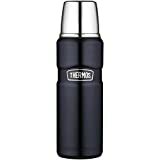 Thermos Flasks (or vacuum flasks as they are sometimes called) are ideal if you want to be able to carry coffee, hot soup for lunch, or cold drinks in the height of summer. 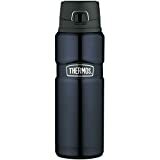 Thermos Flasks (or vacuum flasks as they are sometimes called) are ideal if you want to be able to carry coffee, hot soup for lunch, or cold drinks in the height of summer. They have a double vacuum insulation that keeps liquids at the temperature you put them in the flask. 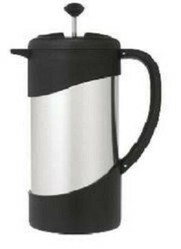 The Thermos Nissan Flask is designed for travelling. Once you have unscrewed the lid at the top of the thermos, you remove a second plastic cup and you then need to push a button which then opens a third leak-proof lid, which has a small opening from which you can pour your coffee. This is an ideal vacuum bottle for work, as you can carry coffee made exactly as you like. It works well for short tourist trips where you are on the go all day and don't want to buy expensive coffee. If you have children, these colorful thermos vacuum food jars are perfect. 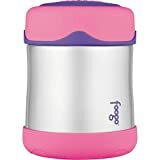 They are light and portable – they are made from stainless steel inside and out, with BPA-free plastic providing the color accents. The base is scratch resistant. The jar has a wide mouth which makes it easy to fill and easy to eat food out of it such as pasta. It keeps food warm for five hours and has a capacity of 10 ounces. It’s perfect for your child’s lunch bag. The Thermos Stainless King Flask comes in a variety of shapes and sizes. For example you can get the 16 ounce flask in a short fat shape (as in the picture) or as a tall thin compact vacuum bottle. Select the shape depending on what use you need the thermos for. The fat food flask has a wide mouth and comes with a spoon, so you can put a meal in there. The compact bottle is more for tea or coffee. All versions of the stainless king thermos are made from stainless steel inside and out. 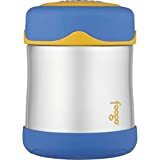 The compact bottles keep liquid hot for longer (12 hours) than the food jar (7 hours) mainly because the shape has a bearing on how the vacuum flask behaves.